It was high water of a big spring tide at 20.30 hr and Nigel and I had decided to spend an hour after bass over the top of the tide. When I arrived my pal was already plugging and further along the shore three or four other anglers were spinning and fly fishing. I'd brought some mackerel bait and the sea was pretty rough so I decided to light leger a fillet on top of a rocky ledge. I used a flat lead weighing less than fifteen grammes a trace about a metre in length and a 6/0 circle hook. 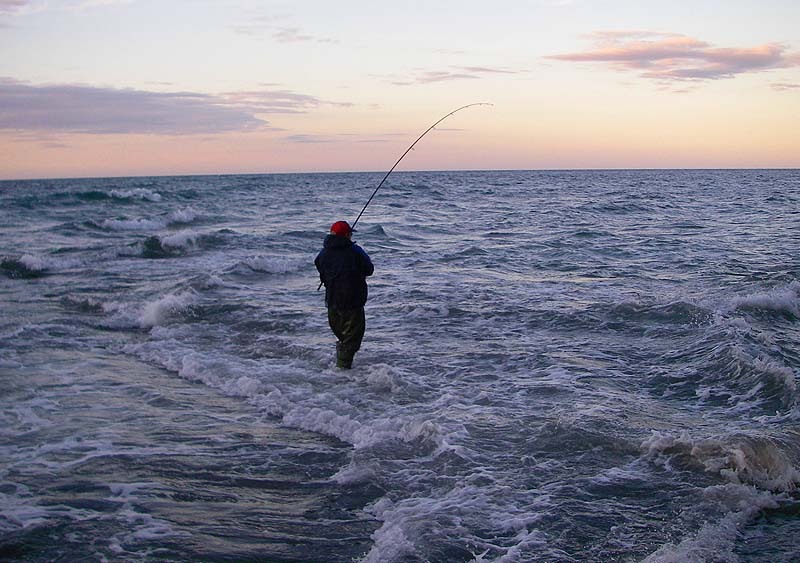 The fillet was hooked through it's thin end leaving plenty of hook exposed and I paddled into the breaking waves and lobbed the bait out about ten metres. The waves rushing over the flat rock quickly swept my bait round until it was only a couple of metres from the water's edge. 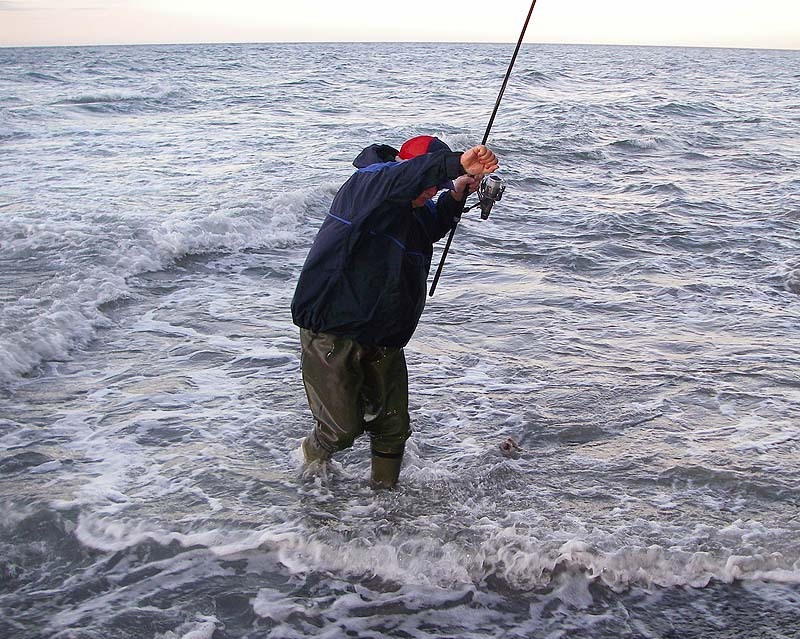 The first two casts resulted in lumps of loose weed catching up on the lead and dragging the rod over. each time I reeled in and cleaned the weed off before casting again. On the third cast just as the bait swung round I felt a sharp double knock and I let the line run out through my fingers as the fish swam off with the bait. I knew it was a bass so I let it take about ten metres of line before tightening but as the line came tight it dropped the bait. On the next three casts the same thing was repeated and I was beginning to get frustrated with my failure to hook the bites. However, each time I got the bait back and cast it out again. By now Nigel had joined me and tackled up with similar gear to my own apart from a slightly smaller hook (4/0) and NO LEAD AT ALL. 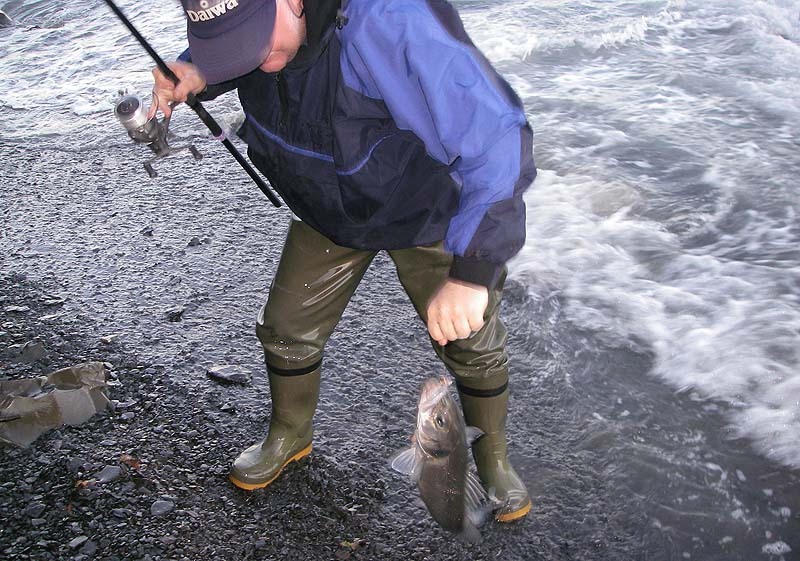 On thinking about it I don't know why I'd put a lead on my gear - habit I suppose - because in the shallow water the bait was bound to be more or less on the bottom and both sets of tackle quickly swung round parallel to the waters edge, lead or no lead. Nigel's big advantage was that the lead was the main 'weed trap' on the line and his free-lined baits were almost always clear of weed. Anyway, as it happened the next bite was on my tackle. Knock! knock! and away it went - five, ten, fifteen metres. I gently flicked over the bale arm and allowed the line to tighten before slowly lifting the rod. A heavy kicking weight told me that this time the fish was on. I played it through the breaking waves and shortly we saw that it was a bass of about three pounds - excellent! I guess the ones I'd missed had also been smallish fish and thus had carried the bait without getting the hook in their mouths. I took a picture and returned my fish. 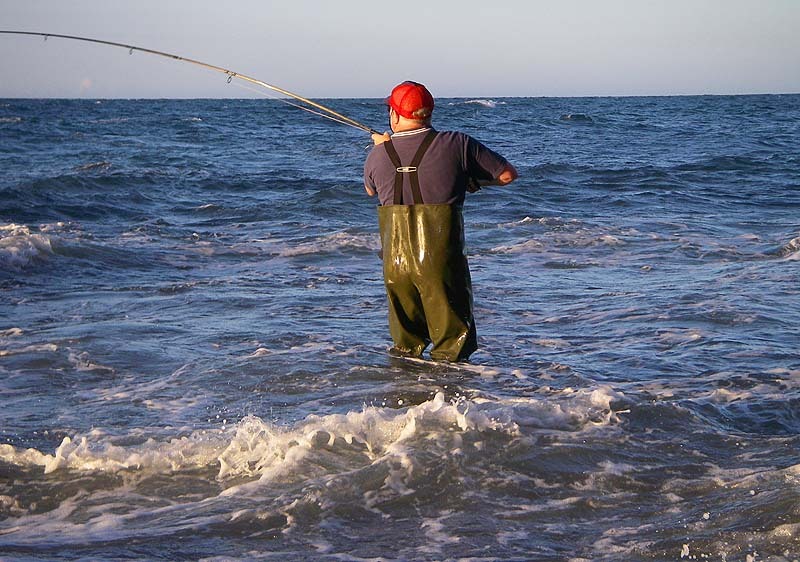 By now it was high water and the surf was quite heavy but Nigel was still managing to fish easily with his freelined bait. He missed one bite and then a couple of casts later he had a second one. 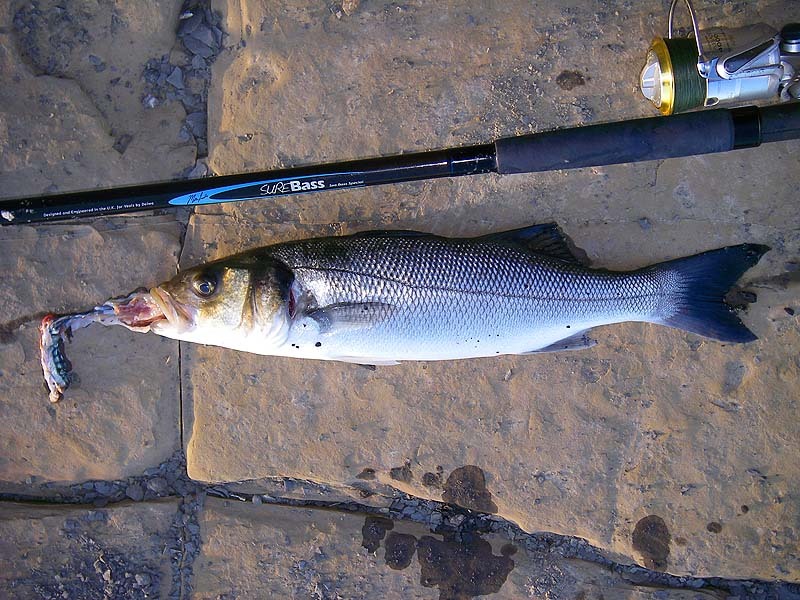 This time he made no mistake and before long he too was beaching a fat, glistening bass somewhat bigger than mine. The tide was turning and after a little while with no further bites we decided to call it a day. I expect that we might have hooked more of the bites if we'd used a pennel rig of some sort and reduced the size of the bait but we'd also have hooked more snags and weed so it's a matter of swings and roundabouts. Experience suggests that bigger bass would have taken the bait in better and been hooked more easily. We already knew that bass come very close in but it had been a lesson to me in just how effective a weightless baited hook can be for bassing even in fairly rough conditions. Nice one Nige!